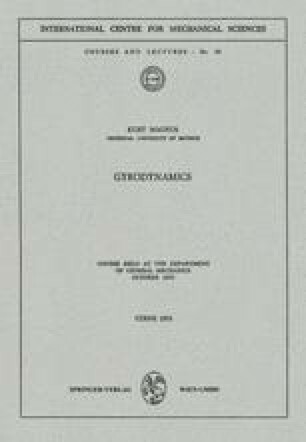 In these notes the term “gyro” is used to describe, quite generally, a rigid body that is performing rotatory (or spinning) motions. The term is therefore intended to cover both the “rigid bodies with a fixed point” of the classical theory of spinning bodies and the fast-spinning gyro wheels of gyroscope technology. However, unlike the frequent practice in the case of technical applications, the term “gyro” is not intended to describe either a rotor enclosed in a housing or, even less so, a complete instrument that contains a fast-spinning rotor.